The spruce up at Le Meurice continues at a stately pace. The ten-year project is particularly impressive for the fact that the hotel does not plan to close for business at any stage. Barely six months after the Parisian landmark’s restaurant and public spaces emerged from a gentle refurbishment by Philippe Starck and his daughter Ara, comes the first of a series of freshened suites. Overlooking rue de Rivoli, the Pompadour actually amalgamates three suites. Working with Studio Lally & Berger, Charles Jouffre has created a modern salon – furnished by a sweep of bold-faced named like Lucien Gau chandelier, Declercq, Prelle fabric and Maison Moissonier furniture – that’s been implanted with all the hi-tech you could point a remote at. At the entrance, an archway designed by Atelier Pierre Bonnefille is painted in a matching hue to a vivid orange and fuchsia, embroidered drapes. 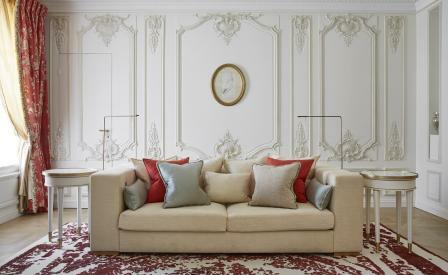 Eighteenth-century armchairs are paired with contemporary sofas. A portrait of Madame de Pompadour hangs above the fireplace; this slides open to reveal a flat-screen television. Another unexpected touch is the reproduction of Josse-Francois-Joseph Le Riche’s Sevres porcelain masterpiece Le Déjeuner that, from its place on a shelf, is reflected in the sitting room mirror as a trompe l’oeil.